Nearly seven years after the fall of Muammar Gaddafi, Libya remains in a chaotic state. The United Nations-backed Government of National Accord (GNA), led by Fayez al-Sarraj, has been unable to extend control over territory held by rival factions, intensifying geographical and political divisions. Armed militias, terrorist groups, human traffickers and other criminal organisations exploit the turmoil, using Libya as a base for radicalism and organised crime, and pose a destabilising threat to the Mediterranean region and beyond. The most recent flare-up in this multifaceted conflict erupted during the last week of August. It has threatened to unravel the fragile power balance between the GNA and its affiliated forces on the ground. The Kaniyat militia deployed unexpectedly from Tarhuna to south Tripoli on August 26 with a large contingent force taking over Gasr ben Ghashir where Tripoli international airport is located. 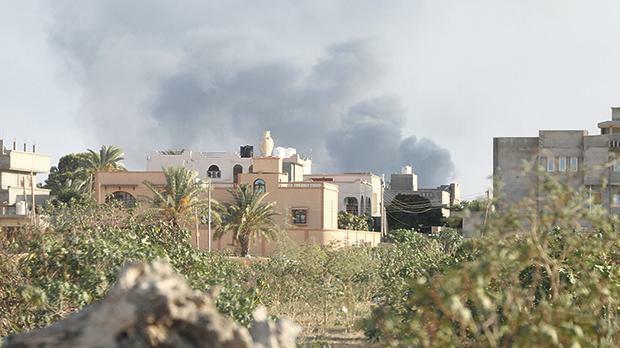 The move provoked Tripoli armed groups under the GNA’s Tripoli military zone, led by Abdul Baset Marwan, to deploy reinforcements to these fronts. These clashes highlight the reality of militia rule in Tripoli and the inability of the GNA to control forces nominally under its control. By the time a ceasefire agreement was brokered on September 4 under the aegis of the UN special envoy to Libya, Ghassan Salamé, 61 people were killed and 159 injured. Many of those dead were civilians, including children. According to the report to the Security Council by Special Envoy Salamé, tanks and heavy artillery were deployed in residential neighbourhoods. Families were forced to leave their homes. Rampant looting and crime became unstoppable as gangs took to the streets. Some 400 prisoners, reported to be Gaddafi supporters, broke out of Ain Zara prison south of Tripoli. Some 8,000 refugees and migrants were abandoned to their fate trapped in detention centres or turned on to the streets. Tripoli stood on the brink of an all-out war, and any semblance of calm that might have existed was shattered. At the roots of the Libyan tragedy is the absence of a unifying democratically elected government with control over the whole Libyan territory and resources. The post-Gaddafi Libya lacked the readiness and the technical know-how for governance, especially in the security sector. In the wake of the revolution, the factions that emerged wanted to have control over their own affairs and rejected all form of centralised governance. In particular, they vied for access to the country’s oil wealth, the largest proven oil reserves in Africa. Rudimentary efforts for reconciliation between the leaders of the uprising began in February 2011, with the establishment of the anti-Gaddafi National Transitional Council (NTC) intended to give a political face to the revolution. In September 2011, the NTC gained international recognition as the legitimate governing authority in Libya and occupied Libya’s seat at the UN. The NTC gave way to an elected General National Congress (GNC) on August 8, 2012. The GNC gave itself an 18-month deadline to agree on a new permanent constitution. It failed, and called elections to a new House of Representatives in June 2014. The move proved disastrous. A group of former members of the GNC, who were not elected to the House of Representatives, denounced the latter’s legitimacy on the basis of the very low turnout (18 per cent) and declared a new self-proclaimed GNC. Pressed by Tripoli militias, the House of Representatives relocated to the Eastern city of Tobruk. Efforts by the United Nations to mend this schism led to the signing of the Libyan Political Agreement on December 17, 2015 at Skhirat, Morocco, and the establishment of the UN-backed government of Fayez al-Sarraj. He has failed to bring the country under unified control, and Libya continues to be run by two rival governments: the GNA in Tripoli and the House of Representatives in Tobruk. The political divide has a parallel military divide. In March 2015, General Khalifa Haftar, former Gaddafi loyalist, was appointed commander of forces loyal to the House of Representatives in Tobruk. In May 2014 he launched Operation Dignity and his forces control Cyrenaica and Benghazi in eastern Libya. To counter this movement an alliance of Islamists and militants was formed under the umbrella name of Libya Dawn and controlled Tripoli and much of western Libya. It later split up into various brigades with differing loyalties, some of which support the UN-backed unity government, others remain undecided. The military situation is further complicated by the presence of the self-proclaimed Islamic State (ISIS), which established a foothold in Sirte and the surrounding area in February 2015. With the support of US air strikes, militias supporting the UN-backed government successfully dislodged ISIS from its headquarters in Sirte. However, it is estimated that ISIS still has between 3,000 and 4,000 fighters in Libya. Taking advantage of the current turmoil, smuggling networks operating across East and West Africa are bringing migrants by road to Libya. Migrants come to Libya believing they can flee to Europe, some to escape from life-threatening dangers and a life of exploitation and abuse, others to improve their dire economic conditions at home. The constant flow of migrants and refugees along the Central Mediterranean route is taxing the political and social fabric of Mediterranean European states, and causing much concern to the European Union as it tries to contain the migration crisis. It is clear that the status quo in Libya cannot be sustained. The international, especially European, community must intensify its efforts to avoid more frequent and widespread outbreaks of violence, as well as further economic collapse and breakdown of the public services of the country. In October 2017, the Security Council endorsed an action plan put forward by UN secretary general Antonio Guterres and his special representative for Libya, Salamé, intended to heal the political divide and address the pressing economic and security challenges. It aimed to negotiate a political package that would lead to the organisation of a national conference to amend the current draft constitution and pave the way for parliamentary and presidential elections within a year. Nearly a year later, on September 5, 2018, special envoy Salamé in his briefing to the Security Council had meagre progress to report on the implementation of the UN action plan. Instead, he gave a harrowing account of the situation in Libya. He reiterated the urgent need to establish strong and unified civilian and military institutions that work for the benefit of all Libyan citizens. To prevent a return to despotism and to help the Libyan people achieve the peace and tranquillity they are desperately looking for, the international community must be unified and determined to continue its work for peaceful political change. To achieve this change high profile meetings and the setting of deadlines are not enough. It is important that Malta, in line with the EU, fully supports the UN process. Malta can also do its part at the upcoming UN General Assembly as the centre stage to promote effective dialogue leading to concrete long-term measures. Malta can and will strive to be a protagonist in this whole process. We cannot solely rely on sporadic efforts steered by regional and international institutions but be focused to take the lead where it matters. Commercially, but mainly politically at a wider European and international level, there is too much at stake. Edward Zammit Lewis is chairman of the Parliamentary Standing Committee on Foreign and European Affairs.